On Saturday, Spectacular Death ran Blackwing Descent. 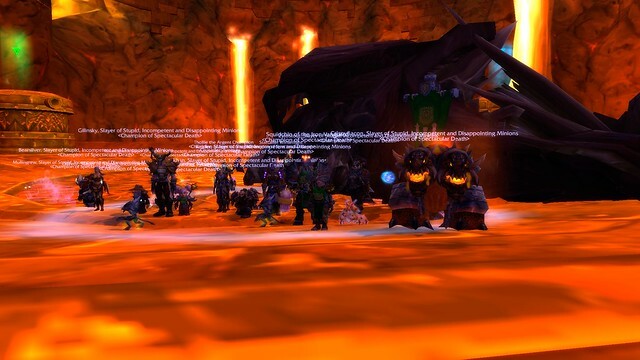 We have rituals in the guild and one of them is to pose after defeating the last boss. It becomes a record of how many times we've faced a boss throughout our guild's history. Blackwing Descent imagined what would happen if Deathwing reanimated the corpses of his slain children, Nefarian and Onyxia. Nefarian is the final boss of Blackwing Lair and Onyxia has her own lair in Duskwallow Marsh. New bosses were added around a central pit where the final battle occurs amid lava and lots of electricity. One of the bosses you fight is Maloriak. It's an interesting fight with Maloriak tossing three different colored vials into a pot behind him and you having to face fire, ice and nature-themed attacks. When you kill him in heroic mode only, you get what is the.best.temporary.title.in.the.game. Period. There is nothing that can compete with this. #1 - Make it obtainable for a large sum of gold, say at least 20,000, only AFTER you have killed Nefarian on heroic. You'd have the achievement to prove that you'd done the fight. Twenty thousand gold is a lot of money, even at the rate you can make gold in the game currently. Not everyone would pay for it. #2 - Award the title to people who have completed the raid in heroic mode a large number of times, say 20 times. The game keeps tabs on how many times you've done a raid. Check your Statistics panel to see all the things the game keeps tabs on. Perhaps we have to start counting from x date and not have it be retroactive. I can live with that. Twenty times is five months of weekly runs. Possibly you can solo BWD, I'm not sure, but it would take dedication on people's part to do this weekly. It wasn't the most popular raid when it was current content. Either way, we'd love to see this title become an option on your title panel. For me, it would be a hard choice between "Herald of the Titans" or this one which one I'd have with my name.